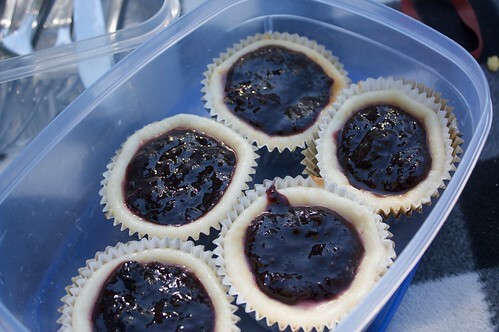 I went on a picnic and baked some mini cheezecakes (as the birthday girl didn't want an actual cake). These cakes were coincidentally based on the cheezecake I baked for Em last year, but why change a delicious cake? I love this cheezecake a lot, and I've been a bit obsessed with mini things lately, so it seemed like a good time to give them a go. I only needed about three quarters of the biscuit base mixture, so it's a shame I accidentally poured the whole packet in to get mushed, as there is now a whole heap of biscuit mixture in my fridge! I pressed about five millimetres of biscuit in to the cupcake containers. A note: use foil cups ONLY. Do not use paper cups. It will end in tears and recriminations when you go to eat it the next day. Other than that alle the ingredients remained the same. I poured the cake filling in to the cake cups, on top of the bases, and put in to bake at 180C for a while. Then I let them cool completely, and made the berry compote and poured it on top. Rich, delicious success! The picnic was lots of fun, it was a perfect day for it. Shar brought soup, which was super delicious, and Danni made the most successful pizza ever. And there was scrabble! And surprisingly I enjoyed watching season one of Friends. I've been a little bit intrigued by Babycakes ever since I first heard of it; however I have little chance of visiting the shop any time in the near future, so it was with delight that I borrowed the Babycakes cookbook from Emilly. I've tried baking two things so far. The first was the gingerbread cake, which I first tried at Emilly's birthday. I was taken by how moist and delicious this cake was. 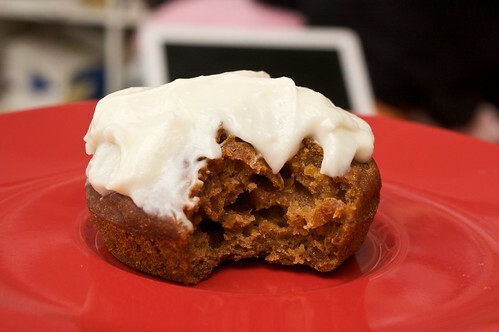 The added pumpkin makes it really moist. I cheated and made a very sugary cream cheese topping instead of making the frosting in the book, but the cream cheese complemented it quite well. The cake itself was tasty, but it dried out very quickly, which is a shame as it makes quite a lot, so there was a lot to get through. look at all that spare apple! 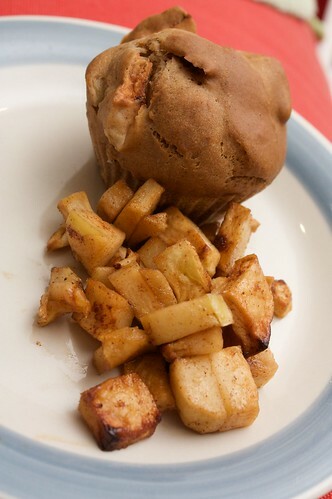 I followed this up with the apple and cinnamon muffins. I get really grumpy at recipes like this, where they tell you to do something (roast eight apples) and then you only use a portion of the end product (one cup of roasted apples). It is a good thing I was feeling lazy and only ended up roasting five apples. There were other modifications I made as I went on, most of them already written in pencil in the cookbook; significantly reduced the amount of agave and the amount of vanilla essence (two tablespoons! ), and some other modifications I cannot recall as the book is not in front of me. Overall I've found the book a tasty experience so far, though of course I will require more testing in order to truely guage how I feel about the book. 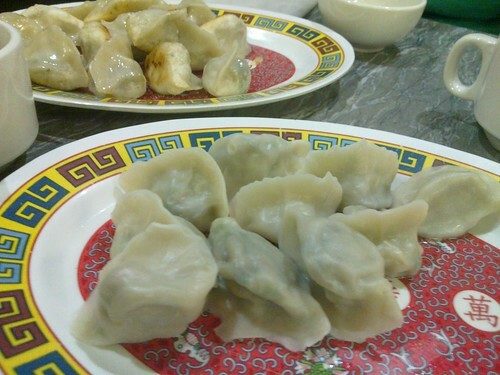 I went to see another MICF show (Fear of A Brown Planet) with Danni, and we decided to go on a hunt for dumplings. Nix had introduced me to Shanghai Village a few weeks earlier, and in our rush to catch a movie for MQFF I hadn't stopped to take photos. Shanghai Village has the usual decor, and very fast service. Both times I've been now I have been able to get a table without too much fuss. The tea is over-steeped but free. We ordered a serve of steamed dumplings and a serve of fried. They're filled with the same things: mushrooms, spinach, carrot, tofu and spring onions (I think); but I like the steamed ones more. This amazing dumpling feast cost $13.50, shared between two, and it was almost too much to finish. Last night I saw my final MICF shows (Hannah Gadsby and Claudia O'Doherty), and I had been thinking about soup all day, so Emilly and I met up at The Soup Place for a quick meal. I'd never been here before, and I'm trying hard to find new dinner places to go to before shows that aren't just LotF (as evidenced by trying out the dumplings). All of their soups are dairy free and gluten-free, so their vegetarian ones are also vegan (they don't put egg in them either), which gave me a big choice to choose from! 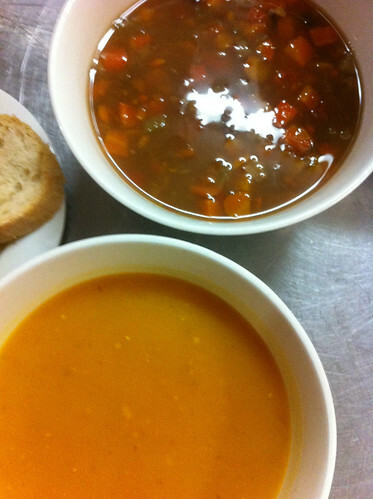 I went the pumpkin, to which I added a little bit of chilli and salt, and it was perfect, exactly what I was after! Emilly went for the lentil and vegetable, which she said needed a bit of salt but otherwise was good. The bowls are big and at only $8.90, not bad for a quick meal before a show. Or before two shows. For ages I had planned to make this curry. 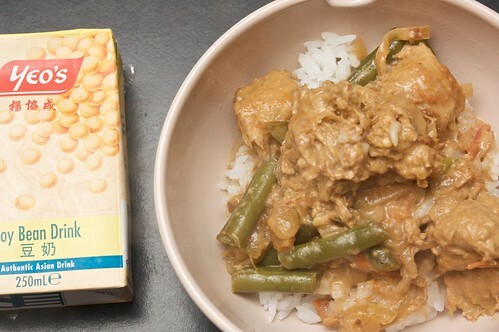 A friend modified her step-mother's fish curry so that it was vegan, especially for me, and it was simple and tasty and filled with familiar delicious flavours. So this recipe sat in my inbox for months and months, and finally last week I went to make it...and every where I went I could only find mock fish with whey in it. Even brands that were previously vegan contained whey. Too lazy to look up any other recipes for new curries, I amalgamated this instead with what I had in the house and in my head (which is like an ode to curries). *so here is the thing about curry powder: sometimes people refer to it as 'inauthentic.' This is a smokescreen! Curry powder comes from the curry leaf. You should never use it as the only spice in a curry, but it is a perfectly cromulent addition to your curry along with many other ingredients! Unless you would like to tell my mother that she is inauthentically Malaysian Chinese. That would be amazing. In some oil, fry the onions over a medium heat until they are soft and translucent (about ten minutes), then add the garlic and ginger until fragrant. Then throw in the curry powder, cumin, tumeric, and garamasala, mix it all together, then throw in a little bit of the water. Let it simmer for a few minutes so it all mixes through and renders down, then throw in the mock chicken pieces. Let these fry in the spices until well coated, then add the tomatoes and the rest of the water. Bring to a boil, then reduce the heat and simmer covered for fifteen to twenty minutes. Or even longer, if you like. After this, add in the snake beans, curry leaves and lime kaffir leaves, and leave to simmer for another ten. Then add the coconut milk, simmer another five, and it is ready to go! So the next comedy show I went to see was Ava Vidal (will link my review when I write it), at Chapel off Chapel. I am not a huge fan of going to Prahran, mostly because I don't know anywhere to eat in the area. I tried to book us in to Oriental Tea House, which Fi had totally talked up; however they were booked out, so I decided Veg Out Time would have to do. After some unfortunate shenanigans, the likes of which we do not talk, Danni, Emilly and I wandered in to Veg Out Time, which was almost completely empty! Danni has already blogged about her meal (summary: tasty). I went for the two curries + half (brown) rice, which was I think $8.90. The curries in the bain marie are all clearly labelled vegan where suitable. 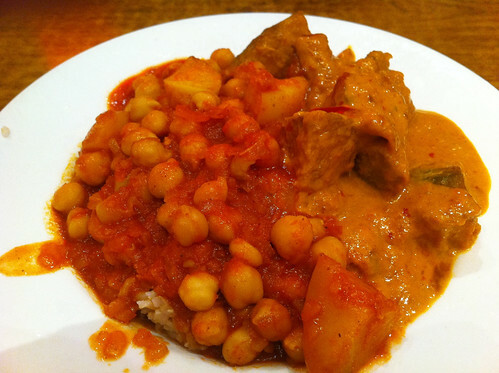 I selected the chickpea + potato, as well as the pumpkin curry. The pumpkin curry was really tasty. Soft and flavoursome. The chickpea curry was also pretty good (I'm really in to chickpea curries right now). Emilly went for the dumpling salad (no photo because it was too blurry). She reports that the dumplings were delicious, but there were only half a dozen of them, on the side of a giant plate of mostly lettuce-y salad, so it was not as satisfying and/or exciting as it was promising to be. Would probably not order again, was the verdict. Maybe she should have tried the dumpling soup? Clear maneuverability and pathway through but the bain marie is probably a bit of an awkward height. Other reviews: In the Mood for Noodles (and previously). Really quick visit to Vegie Bar on Friday after the launch party for Peril 10: Skin, which you should all read. I really recommend Footscray Whitewash by Thuy Linh Nguyen, but I recommend you read them all! Also the next edition is on Food, so you should submit if you can! 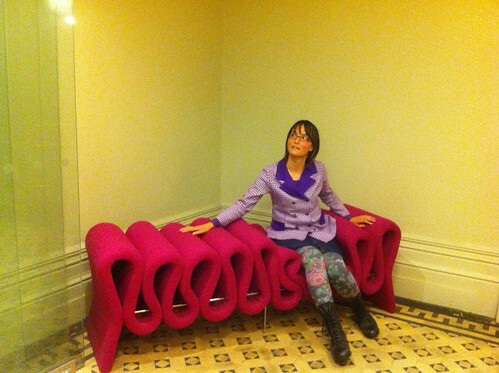 Which reminds me I should put something together before submissions close at the end of April. Anyway, Vegie Bar. We rolled in there about 10pm, and fortunately the kitchen was still open. Everyone else had eaten beforehand so they all went for desserts and entrees (dumplings + cakes). I had been craving pizza since about 6pm, when my friend Lisa had sat in front of me at Friday Drinks and eaten an entire very unvegan molten pizza, and all I had been able to think about from that point on was pizza. This was not that pizza. The flavours were fine, and I was so hungry really anything would have satisfied me, but it wasn't amazing. previous visits: one and two and three. Nobody seems to have reviewed it recently so no links for you! So I met up with E and C to go and see Humourists Read Humourists at the Wheeler Centre as part of the Melbourne International Comedy Festival. In fact it was my first one for the season! (I have since been to see more) As the show was at 19:30, we thought we'd eat dinner first. E had been recommended some Japanese place in the QV Building by a friend, but she said the friend was omni and so there was no way for us to know if I could actually eat there until we got there. So we turned up, and I could not eat there. Not a thing. Fortunately, there was Old Town Kopitiam Mamak just over the other side of the escalator; and if there's one thing I can do, it's make Malaysians cook me vegan food. The food was fine, this is not really a review, I ended up with nasi goreng with the usual substitutions. This is however a PSA: the 'vegetarian curry laksa' is not, in fact, vegetarian. I love Trippy Taco, and I spend a lot of time in Collingwood + Fitzroy, so it surprises me that I don't go there more. However I have been there twice in recent weeks, and both times I ordered the same thing. Usually I am all over the tofu asada burrito (it is giant, and the most amazing ever), but a while back Danni went on and on about how amazing the nachos were, so it was to these I was drawn. These are massive! This is the small, and I would seriously recommend sharing it. The first time I went recently, Danni and I shared this, along with a serve of the Trippy Fries (after checking they were vegan, of course; if you haven't heard, recently and temporarily their fries were not even vegetarian), and the fries were actually too much, I felt sick afterwards from too much food. 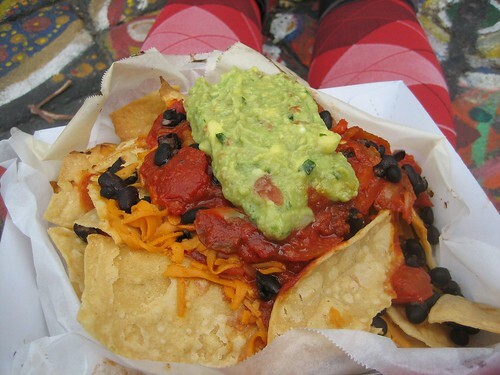 These nachos, size aside, are seriously delicious. The corn chips are hand cut and have this great flavour, and the combination of the black beans with the salsa and the avocado and the vegan cheese is super tasty. They are my new favourites. Having not learnt my lesson re: suitable amounts of food, on the weekend I met up with E, nix, db and nix's friend who is also E, and we had too many people to fit inside (and also there were no tables), so we ordered takeaway and sat in the little paved area on the corner of Gertrude and Smith. 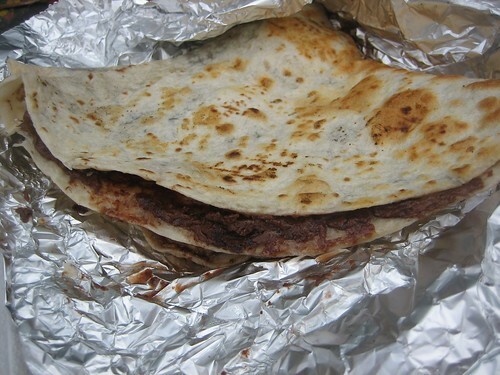 And I ordered not only the nachos (small), but also the choco-banana dessert tortilla. These nachos were still super tasty, but sadly stone cold. If I had been any closer to TT, I would have taken them back, but that whole 100 metres (and a crossing of Smith Street!) was just too far for me. I think what happened was that the choco-banana melt was my downfall and took longer than the nachos to cook/was ready much later, because it was still piping hot when I went to eat it after my nachos. And was it worth it? It disappoints me to admit: not really! Nachos still totally worth it, but I wasn't really that in to the dessert tortilla. After a year and a half of reeeaaaally wanting to try one, this was definitely unfortunate. Perhaps I have learnt my lesson? Really bad for accessibility! A step up, and a hallway that's too small to maneuver down even if you're TAB, and it's always poorly lit. 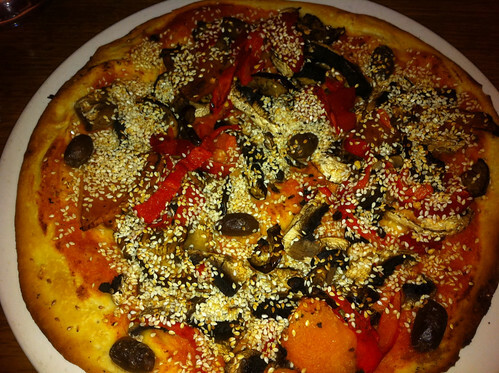 Other reviews: In the Mood for Noodles (and previously); Easy as Vegan Pie; Vegematarian.